Should Vin max be 45V or 26V for NCV8501? I thought I would flag this, with the caveat that it is a bit of a gray area if it should or should not have shown up when I was searching for >=30V. On Semi, Digikey and Mouser all list it as 45V in their data searches. Ah, missed this thread from last week. @abrown, can you please take a look? 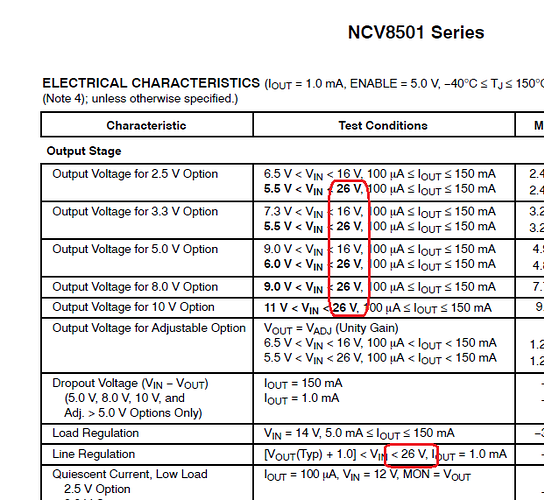 Either voltage could be interpreted as correct, flagged it for being different in case it highlights a deeper problem! Thanks for the catch Rich. It should be a max Vin of 45V. This has been submitted for correction. Apparently the 45V is the "Absolute Maximum" Input Voltage value. 26V represents the maximum input voltage applied under normal testing conditions. You will soon see three attributes for this product class that will clarify it all: Minimum, Maximum and Absolute Maximum. Yeah, it's curious that on semi has that part categorised as 45v Vin Max in their parametric search, I'm not saying they're 'right' (I agree with your interpretation), just different. The extra attributes you proposed will be great for future searches, thanks. There are a couple of other attributes of this device which may also be useful to consider adding at some future date, but maybe too specific to be high priority right now - For example, this device can handle reverse connection faults (up to -15V) and peak transients of +60V.